From 1949 to 1959, Elizabeth Susan Bartlett worked at television station WTTV in Bloomington/Indianapolis where she headed the traffic, continuity, photo and art departments and later became Program Dire ctor. During this time, Susan founded the Hoosier Chapter of American Women in Radio & Television, serving as its president for four years. She spent eight years working for Indianapolis advertising agencies, and was named Indianapolis “Ad Woman of the Year” in 1968. She worked in Detroit as Production Manager for National Television News where, in addition to producing news film for national clients, she wrote, produced, and directed a documentary for the U.S. Department of the Interior, winning 1st prize at the New York International Film Festival. During this time, she also served as president of the Michigan Chapter of AWRT. 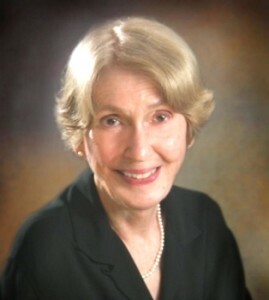 Susan free-lanced in the New York area, producing films for several government agencies in Washington, D.C. before moving to that area where she served as Audiovisual Officer for the U.S. National Science Foundation. While there, she produced radio and television programs that were aired on commercial and public broadcasting stations as well as producing videos for school use. She later returned to Bloomington, Indiana, where she died September 22, 2018, at age 91.